Perry Hoffman comes from a family of chefs, cooks and gardeners. His grandparents founded the French Laundry and the Apple Farm in Philo. His uncle owns the excellent Boonville Hotel and restaurant. His father is a celebrated gardener, and his mother is a great cook and well-known florist in the Napa Valley. So it's no surprise that he developed a passion for food at an early age. "I had this crazy love for it when I was young," says the 31-year-old chef. Over breakfast one morning when he was 15, he told his parents he wanted to cook for a living. They didn't hesitate to tell him what they thought of the idea. "They were, like, 'No, you don't,'" Hoffman says. "'There's no way. You're never going to have a life. You'll have no family and you'll make no money. But,' they said, 'you'll probably be really happy.'" Hoffman chose to focus on the latter part of that advice, and it seems to have worked. 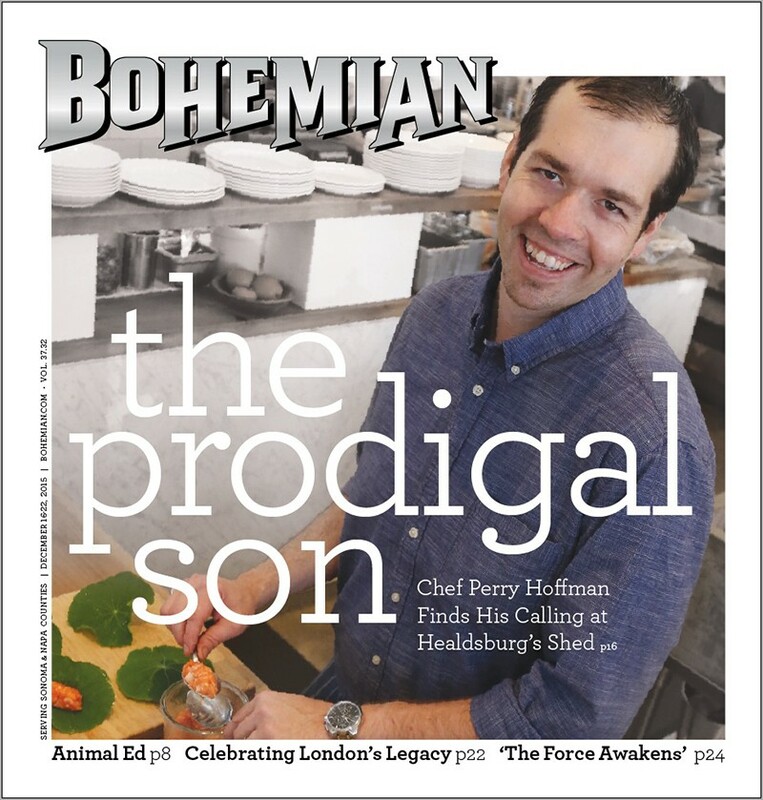 In September, Hoffman was named culinary director at Healdsburg's Shed, a combination restaurant, event space and gardening, cookware and food market. In spite of 10-hour (and longer) days and a commute from Napa (he and his wife are looking to move closer), he exudes the happiness and enthusiasm of someone doing exactly what he wants to be doing. "This a dream place," Hoffman says with a beaming, easy-going smile. "I can learn. I can teach. I can be excited." And, of course, he can cook. Quite well, in fact. The vegetable-centric menu that Hoffman and his cooks have created is accessible and refined, and displays a creative mind, a steady hand and a reverence for locally sourced ingredients. Every restaurant these days claims to be farm-to-table, even though some of those farms are 1,000 acres and grow just one crop in the Central Valley. But Hoffman takes his commitment to locally sourced produce and ingredients to a deeper level. And why not? It's all around him. Hoffman sources as much produce as possible from Shed owners Cindy Daniel and Doug Lipton's 20-acre "HomeFarm" in Healdsburg. Ingredients also come from a who's who of Sonoma County growers—some even come from the planter boxes in front of the restaurant. He has taken Shed's mission of providing the tools and ingredients for good living to heart. "For me," he says, "this whole building was built for a sense of community and coming together, so the food needs to come together too." He means that literally. Hoffman's plates have a natural, fresh-from-the-garden look that belies the thought and finesse that goes into them. Leaves of greens, herbs, flower blossoms, dabs of sauce and delicately placed slices of fish or meat mingle in a casual but thoughtful manner on the plate. There is no tidy separation of meat, starch and vegetables, but rather an artful commingling. 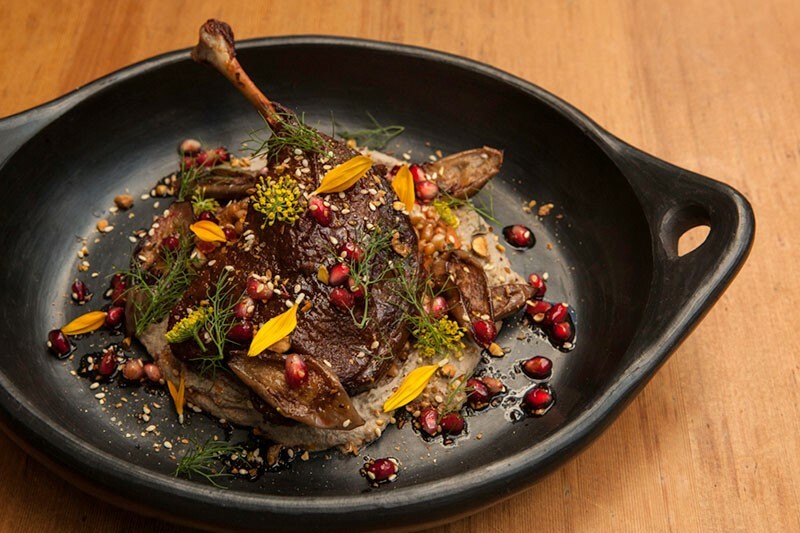 The menu may be rooted in Northern California and Mediterranean cooking, but it borrows ingredients and techniques from Vietnam, the Middle East, India, Japan and elsewhere. More often than not, the focal point is a vegetable or herb, not a hunk of meat. "Protein is almost always an afterthought," Hoffman says. Cooking with what is available in the garden was part of Hoffman's early training at the Boonville Hotel. "There was no plan," he says. "It was just, 'Go into the garden and find something.' I learned to cook that way because it was required. That's what really got me into the garden." The list of starters is a good example of the chef's visual and culinary aesthetics. The Pacific yellowtail sashimi is a garden on a plate. Buttery slices of sliced, opalescent yellowtail share space on a wooden platter with sliced kumquats, butter-lettuce leaves, spicy peppercress and a dusting of togarashi, dried Japanese peppers. The varied flavors and textures work superbly together. The Preston Farms carrot salad is another emblematic dish. The sweet, earthy flavors of carrots, dates, lettuce, nigella seeds and a thick stripe of Straus yogurt play harmoniously in the mouth. Heartier dishes are just as good. I can't think of a better rainy-weather meal than the braised beef cheeks made into stew with sliced fuyu persimmons, savory cabbage and garnet yams in a light veal broth. The addition of pink peppercorns plucked off a local tree adds a finishing high note of aromatic spice. Pizzas made in the kitchen's hearth-like wood-fired oven are thin, crisp and chewy, and topped with unexpected ingredients like sunchokes, roasted slices of Meyer lemons and manchego cheese. "At the end of the day it's just food, but it really needs to have a soul and a purpose and a vision," Hoffman says. He points to a beet and green farro dish as an example of how he approaches cooking. His aim is to create a balance of flavors and textures that riff off a key ingredient, in this case the farro verde, a nutty, chewy, wheat-like whole grain that, when roasted, attains a delicate, smoky flavor. The beets echo the bass notes of the farro, while crèma de lardo (buttery emulsified pork lard spread on little toasts) pays homage to the grain's Italian roots. "We're doing everything we can to complement the flavor of that grain," he says.